I can still smell the gasoline fumes and my eyes sting from all the wasteland dust. This movie was a thrilling two hour ride of nonstop action that I will never forget. I always like to say that life is about experiences rather than material things. I can promise you this film really fits the mold of a big cinema experience you do not want to miss. Set in the dystopian future and filled with enough absurd vehicles to make any Carmageddon fan happy this movie just drips with badassery. My wife was so impressed she is now curious about original Mad Max stories after seeing Fury Road. As we left the theater I started to imagine armor plating and a swivel mounted Ma Deuce on my Odyssey van. That would be be really cool for those two hour long traffic jams so common outside the city! 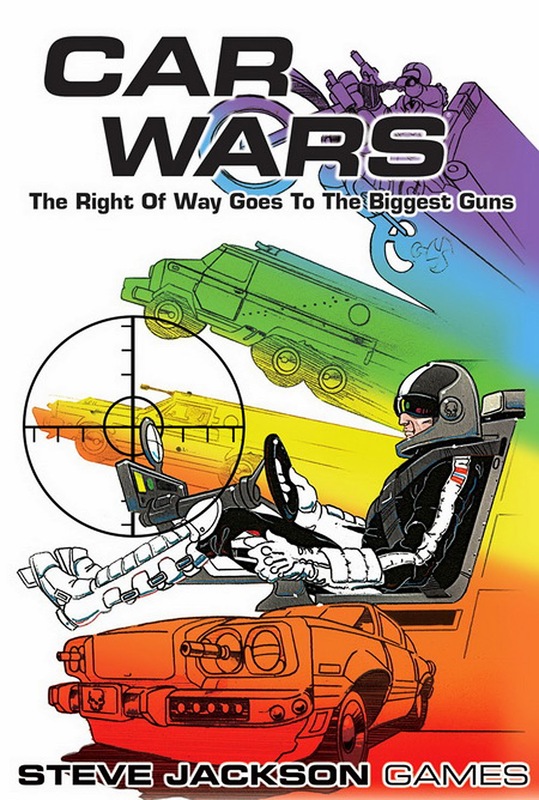 The biggest take away however was me immediately digging out my Car Wars box and dreaming up a new campaign. My wife suggested that maybe we use the End of the World RPG for the characters and I may run with the idea. 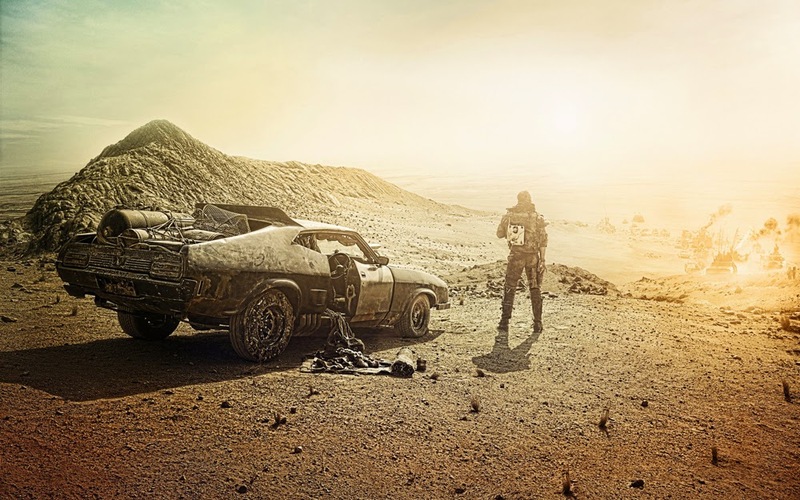 The great thing about the world of Mad Max is the complete and utter chaos it swirls in. I really like the idea of a campaign where the player’s ultimate goal is just survival. The former lends itself to sandbox style play better than just about any scenario save just good old exploration. If you have been on the fence about Fury Road I encourage you to go see it. 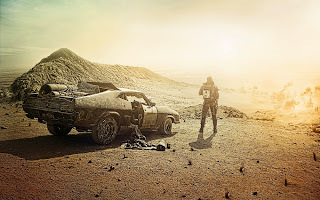 After being drowned in super hero cinema, vanilla action movies, and fantasy flicks that have lost their luster Fury Road is high octane awesomeness. Don’t let negative blog posts trying to pin the movie with gender politics cloud your vision. Get your wasteland goggles on and go enjoy probably one of the best nitrous powered apocalypse movies made. For those of you planning on running a similar campaign after being inspired by Fury Road here is a random table of wasteland encounters. Ultimate difficulty is up to you my fellow game masters. Now get a d6 and roll away but warn your players their mileage may vary! 1. An emaciated dog found by the side of the road. One of its legs was replaced with a fully functional cybernetic limb. The dog is friendly and happy to see people. Whoever feeds it will gain loyalty from the dog. Close examination of the dog reveals fresh one eyed skull branding on its hindquarter. 2. A motor bike driving down the road without any passengers. The speed of the vehicle is approximately 20mph and it has two large saddle bags. The bike is being controlled remotely by nearby bandits. If a player vehicle gets close to the bike the saddle bags will detonate with road spikes in an attempt to flatten their tires. 3. A dilapidated building that once served as a fuel stop. Investigating PC’s will notice the smell of fuel around the area. Next to one of the old pumps are two fuel canisters. Inside the building is a horribly mutated wanderer who has been syphoning the fuel. The wanderer is addicted to the fumes and will defend his “fix station” to the death. 4. The sounds of strange music will fill the area as the PC’s see a vintage ice cream truck. Atop the truck is a massive chocolate cone decoration which conceals twin machine guns. The driver is a cannibal dressed in clown attire with rotted yellow teeth. The truck will stop and just play its music until curiosity brings the next meal close enough. The refrigerators inside the truck still work but are currently filled with unsavory things. 5. A crashed tour bus which appears to have had its tires spiked long ago. The bus was refitted with iron plating although some of its tinted windows are visible. Smear marks from inside the bus are visible to those inspecting. Any PC approaching will be startled by ghoulish faces smashing up against the windows and horrific growls. The tour bus contains 2d10+5 wasteland zombies and also a very visible supply of sealed military rations. 6. A lone child walking the wasteland covered in black ash. She appears to be unharmed and wears suitable clothing for wasteland travel. She cannot remember her name and only recalls a loud explosion. The PC’s will notice someone wrote a message on her backpack which reads, “Please save Lucinda. Take her to Geartown to the west. You will be rewarded”. Unbeknownst to the PC’s Lucinda is not this child. This child was part of the raiders which destroyed Lucinda’s convoy and she took the backpack. During the event one of the vehicles exploded crashing the child against a rock and she was left for dead. The child has acute amnesia of the event however giving the PC’s little warning. It does not get more metal then this!